You may feel that once you hit the entrance of the airport for vacation, you’ve got a pass to indulge in all food that comes your way. However, we all know you’ve worked so hard to maintain a healthy weight, you don’t have to throw it out the window for a cinnamon bun, ribs and draft beer in one sitting. With simple strategic tips, you can kick off your vacation, yes, still at the airport, without overloading on calories, excess sugar and fat. In addition, since traveling can cause an increased risk of dehydration, constipation, circulatory problems and added stress, it’s more imperative than ever to be more mindful of how to select healthier options. 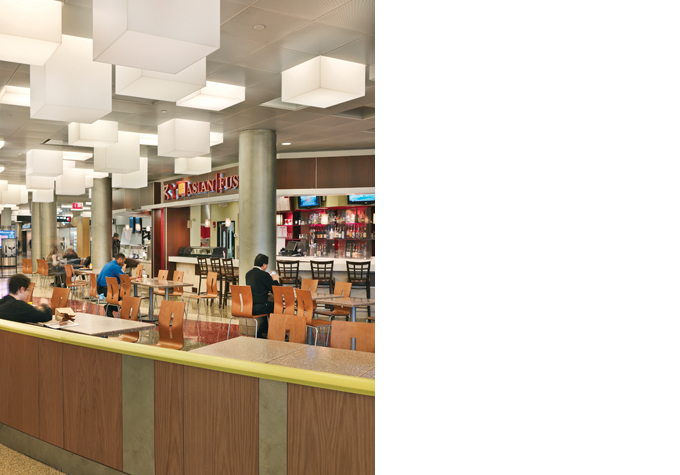 While each airport prides itself on their unique layout, many airports share the same staples of restaurants and food options, which is great for us, as a lot of the following tips can be used for domestic and international airports. Instead of just providing broad suggestions, we’ve taken a closer look into some fliers favorite go to kiosks, providing suggestions on how to opt for the less guilt free version of foods. Or, better yet, just drink it black (5 calories!). 1. When choosing salads, ask for the dressing on the side, or better yet, stick with olive oil and vinegar. 2. Choose fiber rich fruits and vegetables that are high in antioxidants. Many airport kiosks offer bananas, oranges and/or apples to go. Fresh fruit is a great airplane snack. 3. Prior to heading to airport, research airport’s website for the best place to grab a healthy meal. If you’re short on time for searching, Starbuck’s usually has healthy options. 4. Bring healthy, portable snacks with you to enjoy on your flight (i.e. apples, peanut butter sandwiches, carrots, nuts, dried fruit, etc). This is truly the best option if you have the time to pack up some food. 5. Before picking the first restaurant you see at the airport, take a lap around the terminal and check out what’s offered. Who knows, you may find a new favorite. 6. Stay hydrated by purchasing bottled water or unsweetened iced tea. 7. Avoid rich, greasy, fried foods as it can trigger acid reflux (also known as GERD) or an upset stomach on flight. 8. Aim for lower salt foods to avoid feeling bloated during your flight. Good choices to bring along include fresh fruit, cut up raw vegetables and unsalted nuts. If you’re looking for a bit more direction in what to eat, look no further than your smartphone! With the Calorie King app, created and maintained by registered dietitian nutritionists (RDNs), it identifies menu options and their nutrition facts from over 200 chain restaurants, so you can make the best choices, whether traveling or at home. By using the above tips, your next flight and vacation should go smoothly, with a bit of healthy flavor, too! Lisa Stollman, MA, RDN, CDE, CDN was recently honored as the 2015 Outstanding Dietitian of the Year by the New York State Academy of Nutrition and Dietetics. She is the author of The Trim Traveler: How to Eat Healthy and Stay Fit While Traveling Abroad. For more info on Lisa, please visit here. Special thanks to Nikki Nies for helping with the writing of this post.